Audi's new flagship SUV comes with '80s styling and a mechanical center diff. 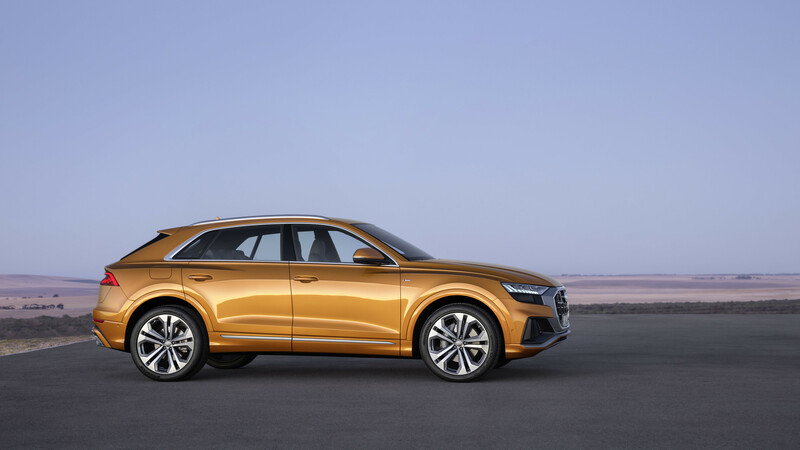 Topline: Audi revealed the production version of its new Q8 full-size SUV at the automaker's Brand Summit in Shenzhen, China on Tuesday. 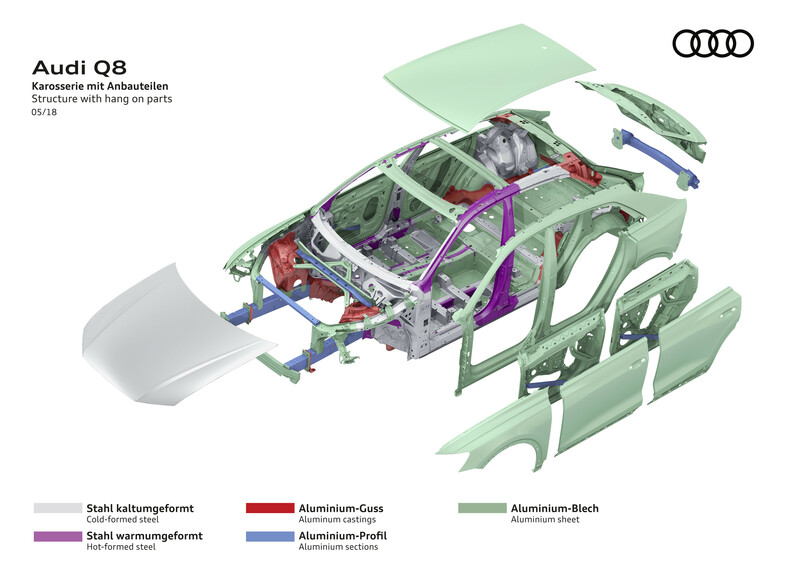 Naturally, it'll sit above the Q7 in Audi's lineup and directly compete with the BMW X6 and Mercedes-Benz GLE Coupe. What's New: Making good on its promise to no longer design cars with a photocopier and adhering closely to the concept that preceded it, the Q8 doesn't really look like any other Audi on sale today. Whether that's for better or worse is up for you to judge. 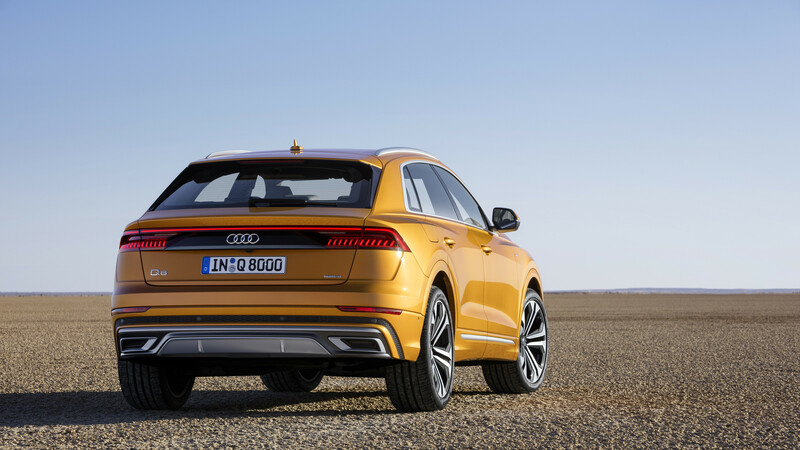 If you ask Audi what it thinks of its big new baby, however, it'll say it shares a familial resemblance to the original Quattro from the '80s pointing to the black strip that connects the taillights, "strong contours, and athletically tight surfaces." Eh, whatever you say, Audi. Under its skin, the Q8 gets a mechanical center differential that can send most of its power to either the front or rear axle, as needed. Coupled with 10 inches of ground clearance and hill descent control, the Q8 should be quite the performer offroad. When owners aren't frolicking in the sand and snow, the big Audi's optional all-wheel steering and 48-volt mild hybrid system keep the drive stable, agile, and economical. 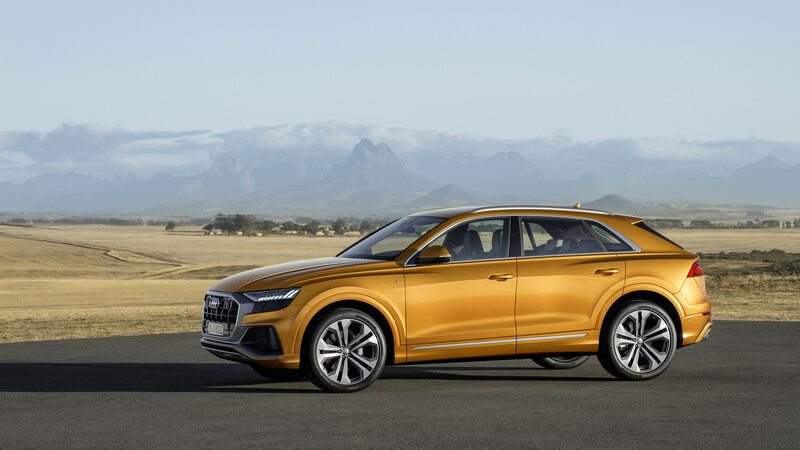 Quotable: "The Audi Q8 combines the elegance of a four-door luxury coupé with the practical versatility of a large SUV," read the press release. The company goes on to boast that it "exudes sporty dynamics and upscale prestige like no other SUV from the brand with the four rings." 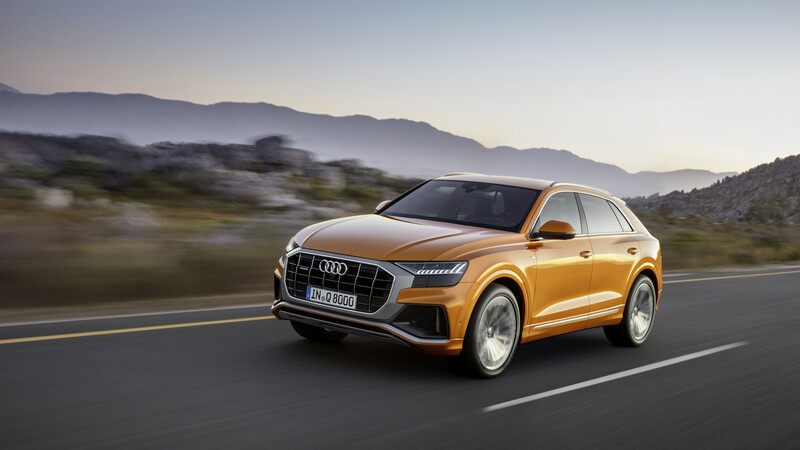 What You Need to Know: While it sits above the Q7 in prestige and, presumably, price, don't expect the Q8 to dwarf its lesser stable-mate in size. 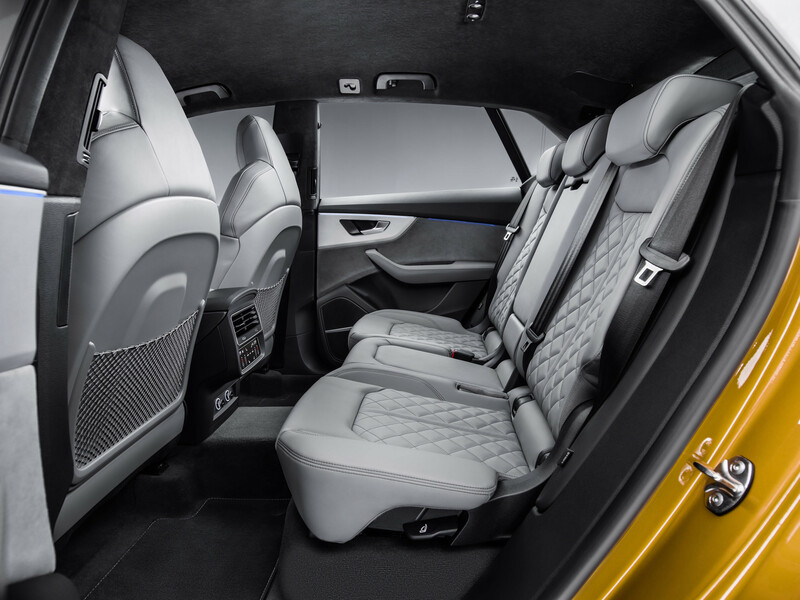 Although it's wider than the Q7, the Q8 is shorter, lower, and only seats five. Audi says its new flagship SUV is "the new face of the Q family." Whether or not that's code for "expect every Audi SUV to look like this from here on out" remains to be seen. This being the latest and greatest SUV from the Volkswagen Group's mainstream luxury arm, expect the Q8 to sell like bananas in a monkey colony, regardless of what you think of its design. The Q8 Sport may not be in the S or RS line, but the performance numbers say otherwise. The upcoming flagship SUV will be more powerful than the uber-quick Audi TTRS. Audi's big SUV packs an impressive amount of style and luxury—without breaking the bank. First impressions from behind the wheel of Audi's sporty midsized soft-roader. The German luxury trio is out.